The evolving front-page of The Herald, under new editor, Jonathan Russell, has taken on yet another visage today. The top-of-the-page promotions strip has been supplanted for the day by a deep, across-the-page white on black box on the life and times of erstwhile Scots journalist, Jimmy Reid, with a striking profile picture and heading, ‘The great Orator’. Inside, there is a gripping four-page broadsheet tribute supplement on Reid, who died earlier this week, aged 78. The front page of the supplement is totally devoted to a brilliant picture of the young Reid clutching a microphone while delivering yet another of his legendary powerful speeches. 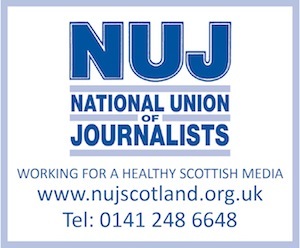 Aberdeen-based media pundit, Hamish Mackay, told allmediascotland: “This is a marvellous example of high-quality journalism – both in word content and archival photographs. “Anyone, like myself, whom knew Jimmy when he was stomping around Scotland leading the save the Upper Clyde Shipbuilders campaign, will feel compelled to buy today’s Herald. Reid joined The Herald as television critic in the late 1970s and became a columnist until the late 1980s. He wrote for the newspaper again for few years at the of the 1990s.